When we walked into Rebecca Haseltine’s open studio at Hunters Point, we were struck by a great sense of flow and fluidity. The marriage of colors with the organic forms of the pieces capture the ebb and flow of life. Inspired by the patterns and sediments in estuaries, Rebecca submerges herself into the "rhythmic exchange between land and water." 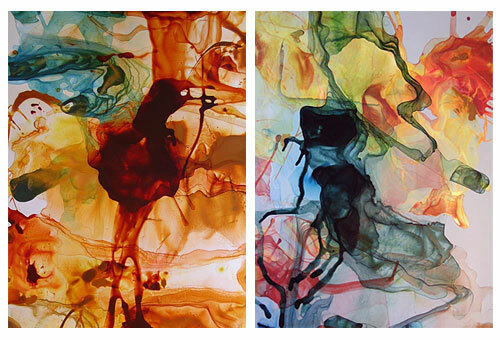 Shown below are pieces from the Mud: Estuary/Phase V, titled Tidal Pourings. Many of the pieces extended from floor to ceiling, engulfing the viewer into the gritty dynamic of nature's rhythms. We noticed that her work inspired many to sit and contemplate her unique vision. Shown below is close-up details of another of Rebecca's collections – the Plunge: Estuary/Phase IV. To see more of Rebecca’s work, visit her web site at www.rebeccahaseltine.com. 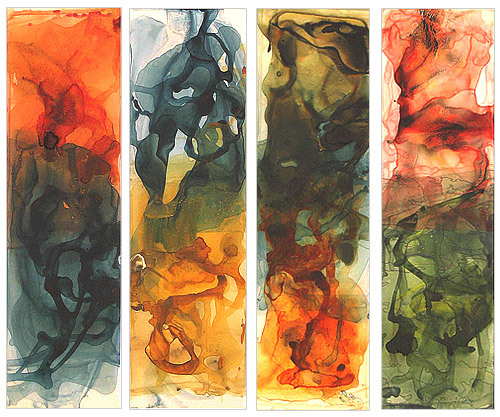 She currently (June 12 to August 8, 2008) is showing at the Water Project, Thoreau Center for Sustainability, San Francisco. Click here to learn more about the exhibition.